With its wooden housing and linen shade, the handmade accent lamp elegantly stays on your desk, casting soft and comfortable illumination. 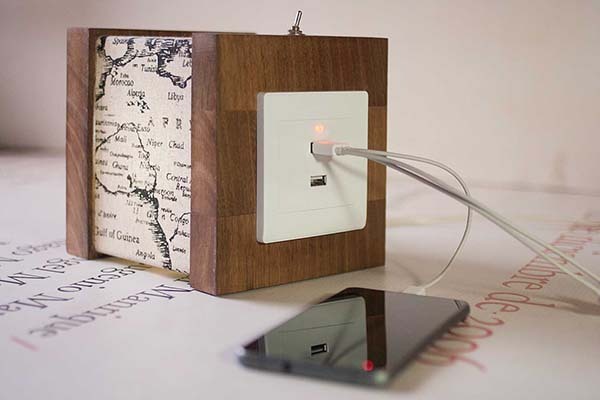 Two USB ports allows it to charge your mobile devices. 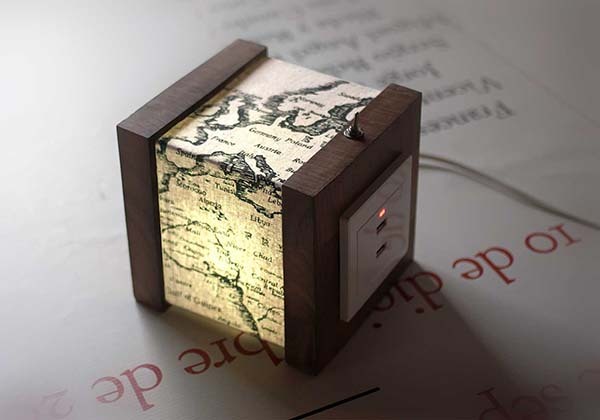 This is a well-crafted and versatile USB mood light handcrafted by LuzDelBosque, a small handicraft studio from Spain. The lamp measures 5.9 x 5.9 x 5.5 inches (15 x 15 x 14cm). As we can see from the images, it shows off a minimal cubic form factor, and the walnut housing delivers a solid construction and gorgeous wood grain. Meanwhile, the shade is made of cotton linen fabric for an elegant and vintage style, and the pattern of world map adds some exotic aesthetics to the lamp. The accent lamp supports up to 60w E-27 bulb. Through the vintage fabric shade, the lamp gives an original touch to your home. Its integrated cord measures 130cm long for easy to plug in a wall outlet. Moreover, the wooden lamp comes equipped with two USB ports that can be used to charge your smartphone, tablet and other mobile devices. The handmade wooden accent lamp is priced at $61.88 USD. If you’re interested, jump to Etsy for its more details. BTW, don’t miss the Super Mario accent lamp and more related gadgets by following tags.